The Kangaroo Aussie Cabinet is ideal for someone who has a large sewing space and room to spread out. The thing about this cabinet that impresses me most is how much surface space it has when fully extended AND how compact it can become when fully closed. 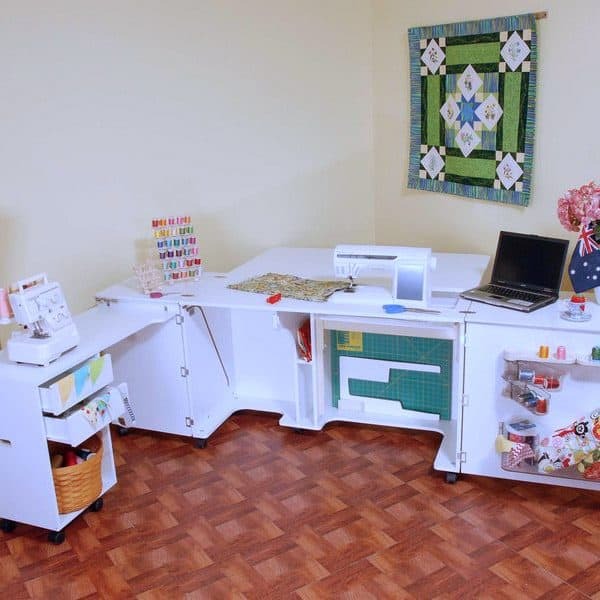 There’s room for a serger and lots of clever storage. It sells in the $1,150-$1,250 range. It includes many of the same features that you will find on other Arrow or Kangaroo cabinets such as an airlift for raising and lowering the machine and the optional custom machine-specific insert. It’s available in white or teak. Has wheels to easily move if needed.